The style and visuals are very cool, but the plot wears thin and the action all but disappears as the movie goes on. 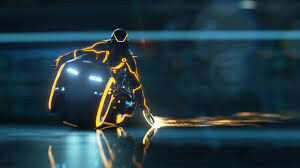 Tron: Legacy is a movie that was meant to look cool more than anything else. And it does. Seeing it in 3D is a nice addition, but the movie would be pretty neat to look at no matter what. It has clever ideas for games and sports and competitions. There’s one early on, for example where these circular discs are thrown around like frisbees, only the idea is to use it more like a weapon or a boomerang and send it right through your opponent, instantly killing them, shattering their body into glass pieces. Strange, I know. But visually pretty cool. That’s really all this movie is. The plot starts out pretty decent at first, when it’s in the real world with live action and deals with a son, sam flynn, whose father disappeared about a decade ago, when sam was just a boy. the son now has it in for the people who took over his father’s company and goes to elaborate lengths to play pranks on them. sam goes to visit the arcade where his father worked and is suddenly transported into the world of tron. Here, he is quickly thrown into that disc hurling competition and then meets the movie’s villain, clue, who looks like a young version of his father and is a sort of king of this land. From here, the plot goes in all sorts of directions and gets very confusing or deep or tricky to follow. It takes effort to understand this world, and i’m not entirely sure that the payoff is worth it. The action and cool visuals also start to get tiresome as the movie goes on. It’s not that we’re used to them and that’s why they’re not as fantastical, but that the movie suddenly runs out of new ideas. When we first got into this world, there was the disc game and then an amazing motorcycle fight competition with drivers going up and down all different levels of “the Grid.” But after that, the cool ideas started to slow down. By the end, we’re watching star fighter spaceships firing at each other in what feels like a scene out of the first star wars movie with a character in a chair and two giant guns on either side of him firing away. Star Wars was made in the seventies. 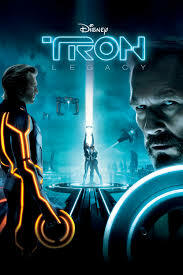 And this tron: legacy is supposed to be state of the art, cutting edge. It shouldn’t feel like anything we’ve seen before, let alone something from thirty years ago. It’ not surprising that the plot is far from great, but the real shocker is that even the visuals can’t be maintained for the whole movie. When the neat things they can come up with and cool action ideas start to run out, you know you’re in trouble. I suppose they try to bring in new vehicles, giving us the planes, but they are not on the same level as those motorcycles. for one thing, the motorcycles worked because of the grid that they were strapped to, and how it had different levels or ramps going up and down. the planes have nothing but free air to fly around in. there’s a nice cameo by michael sheen here as a sort of architect named zuse, and james frain from the tudors and true blood is right there standing beside clue the whole movie as his freaky looking sidekick. but what matters is how these characters help the plot along. sheen does, giving us a few cool scenes. frain is more like a gimmick, standing there, off to the side. the big problem with the movie is that it started off really great. the first thirty minutes or so were fantastic. there was that opening voice-over by jeff bridges, explaining a little bit about the grid and that eerie music surrounded by all the glowing images. this is a movie where watching it during the daytime or watching it in the dark makes a huge difference. this movie needs to be watched in the dark. it is a nighttime movie filled with glowing spectacles. the disappearance of sam’s father is handled well, as is his rooftop stunt against the company. even his apartment meeting with alan, his father’s partner from long-ago, who is now looked at as a crazy old man, is a fun scene. and then sam goes to the arcade where we get journey blasting as he walks down the lit up aisles of video game machines. it’s all pretty cool and well-done. but once he leaves the real world and gets into the world of tron, things start to fall apart. the reason why things go wrong for the audience once he gets into that other world, is because the movie throws all of it’s cool ideas at us at once. almost right away sam is thrown into the deadly frisbee games, (which are just like futuristic gladiator games). and those scenes are fantastic. and then very shortly after that we are with him on the motorcycle racetrack, something that should have definitely been saved for the climax. the movie was banking on those planes being as exciting or more than everything that came before it, and boy was it wrong. the movie has a lot going on and is definitely a cool experience, but the plot drags on and doesn’t keep us riveted the way it should, and the cool ideas run out by about the halfway point.